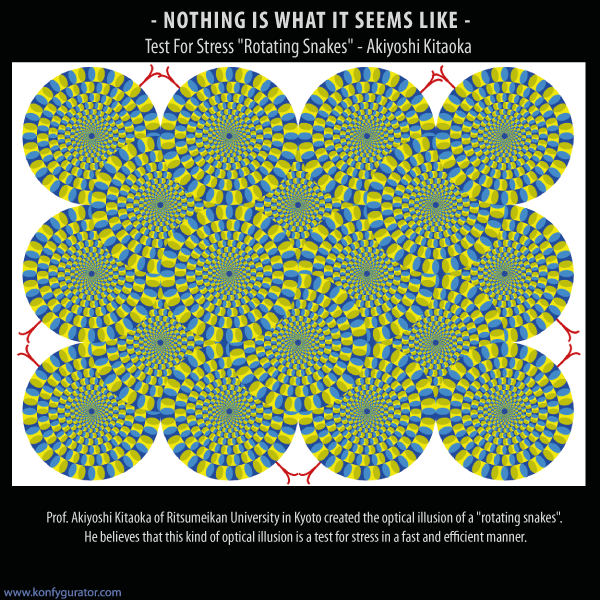 Prof. Akiyoshi Kitaoka of Ritsumeikan University in Kyoto created the optical illusion of a "rotating snakes". He believes that this kind of optical illusion is a test for stress in a fast and efficient manner. If the rings are watched longer, where they do not move - that's a good sign because it supports the fact that you are very calm and relaxed. However, if you think that the circles are slowly spinning, it's a sign that you are tired and you need a break. If the circles rotate at high speed, its an alarming condition for humans and it means that those are under enormous stress, and recomendation is that such person should consult their own physician.